Welcome to September's newsletter. Apologies for being a day late this month. I've been working on my first eBook (finally got around to it!) and have only just submitted it for approval. Been on your holidays? Going soon? If you're planning on spending some time in the pool these tips are for you. Or, if you anywhere taking an action photo, this is for you too. If you need to capture a moment - and freeze the action - you need to understand a little about how your camera works. Your camera controls exposure by adjusting the aperture, shutter speed or the ISO (there's more detail on understanding exposure here). For the purposes of this month's tip you need to control the shutter speed. Have a look at your camera settings, if you see a sports program use it. 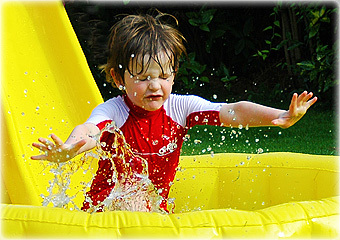 It is designed to offer you a fast shutter speed that will freeze movement. I'm mentioning this because compact cameras come with so many modes that often we put it on one mode and forget there are another half-dozen modes in there! If you have a digital SLR you're lucky because you can directly control the shutter speed - in this case look for either "S" or "Tv" on the selector dial. Once into shutter speed mode select the fastest speed you can - this will be the highest number. And then start snapping! If the light is low your camera will struggle with a fast shutter speed - you might need to turn the flash on to compensate. Your camera might struggle to focus quick enough. In this situation, focus on something stationary next to your intended subject, and then wait for the subject to get to that point - then take the shot. Anticipate movement - if it's a ball game you're photographing there will be moments when you know you can catch your intended subject in mid-pose. If you're ready (because you anticipated it) you stand more chance of getting the shot. Finally, a bit of practice helps, so get out there and give it a go! ...and back to the eBook. Finally (it's taken almost a year) I have finished my first eBook. It's a complete Digital SLR Guide and includes two bonus eBooks plus a triple part guide on making money with your camera. As I said at the start of this newsletter it's been submitted for publication and I hope to hear any day soon. With a bit of luck and a fair wind it will be available by next month's newsletter - which should give me time to work out how to offer my subscribers a discount!